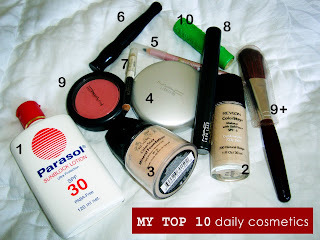 Hi everyone, I'd like to share to you guys about my TOP 10 daily cosmetics that I use. First of all, I love to put make up on my face, never too much but quite bold and fresh. But I never have a problem either if I'm not wearing make up, its just an optional thing. Here are my top 10 cosmetics. Last but not least is Hare lipstick. This lipstick is unique, if you apply it too much, it'll lasted for more than a day on your lips! so use it gently and super thin. This is it! 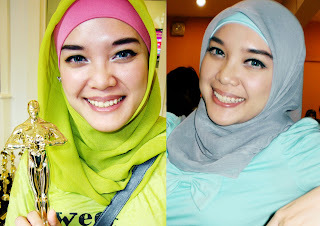 my daily make up look. oya boleh nanya,,klo pas abis solat kena air wudhu, touch up lagi pake 10nya ga kak? sunblock itu di apply nya tiap kapan? klo udh wudhu, apa perlu diulang lagi pake sunblock dll. mo nanya dong, beli hare lipstiknya dimana ya?